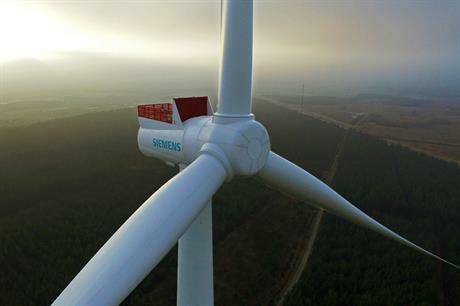 DENMARK: Siemens has commissioned its 8MW prototype turbine at the National Test Centre in Osterild, northern Denmark. The SWT-8.0-154 turbine was unveiled by Siemens in July 2016 and the design was awarded initial approval by certification body DNV GL earlier this month. Siemens said the new prototype will be tested throughout 2017 and final type certification is expected in 2018, with serial production set for 2019. The machine replaces Siemens' 7MW turbine at the test centre, installed in May 2015. The German manufacturer said its new offshore machine will be able to produce 10% more energy than the 7MW model. "Since the higher rating will be achieved with only a few component upgrades, including a new cooling concept and a new control system, customers will again benefit from key value drivers including fast time-to-market and low risk," Siemens said. Siemens said its entire offshore direct-drive platform (the 6MW and 7MW turbines) have completed 100 years of combined operation, reaching 2.5TWh of electricity production.